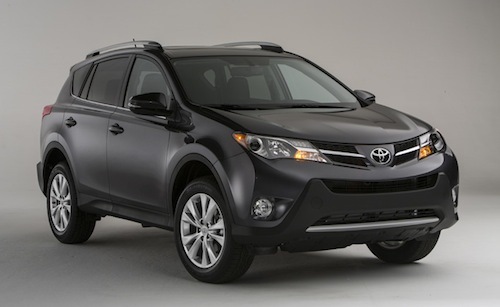 Toyota has just announced the pricing details for the all-new 2013 Toyota RAV4 SUV lineup. Now in its fourth generation, the redesigned 2013 RAV4 crossover vehicle is set to hit dealerships next month. The reinvented RAV4 touts improved performance and capability, increased fuel efficiency, an exterior revamp, a laundry list of standard features, and a class-leading eight standard airbags. So what how does this substantial overhaul translate in terms of price? The base 2013 Toyota RAV4 LE FWD is priced at $24,145, which includes an $845 destination charge. The RAV4 LE AWD model features an MSRP of $26,535, including destination, while the XLE boasts a price of $25,135 (FWD) and $26,535 (AWD). The high-end Limited grade RAV4 will retail for $27,855 (FWD) and $29,255 (AWD). All prices include the $845 delivery charge. Most noticeable, is that the entire 2013 Toyota RAV4 lineup is priced under $30,000. Conversely, the 2012 lineup contained one vehicle with a price tag north of $30,000: the top-of-the-line 2012 Toyota RAV4 equipped with a 3.5-liter V6 engine. The 2012 RAV4 Limited featured a price of $31,305, including destination fees. Although Toyota lowered the price on the higher end RAV4 model, it raised the price of its base model by $650. The new RAV4 is prices higher than competitors like the 2013 Honda CR-V and the 2013 Ford Escape, but less expensive than the 2013 Hyundai Santa Fe. In terms of upgrades, the 2013 Toyota RAV4 lineup features a new exterior design, which includes a sleeker roofline and more aggressive character line. The all-new RAV4 also contains two-row seating for five passengers and premium interior materials, which includes driver-centric controls and soft-touch accents. Unlike previous generations, the 2013 RAV4 touts a handy roof-hinged liftgate with a space saver spare tire, rather a side-hinged rear door. Performance wise, all 2013 RAV4 models will be equipped with a 2.5-liter four-cylinder engine and a six-speed automatic transmission. Not surprisingly, Toyota was able to dramatically improve the RAV4s fuel efficiency by ditching the V6 option and equipping all models with the more economical four-cylinder alternative. In fact, all FWD models received an EPA-estimated fuel efficiency rating of 24 mpg/city and 31/highway. Each AWD model features an EPA-estimated rating of 22 mpg/city and 29 mpg/highway. The new 2013 Toyota RAV4 lineup offers drivers a livelier driving experience with technologies like Sport Mode with Dynamic Torque Control AWD and improvements like optimized electronic power steering. Each model also features its own impressive list of standard features. Not only does the base model boast privacy glass and color keyed door handles, it also contains 17-inch steel wheels and a 6.1-inch display unit with an integrated back-up camera. The more expensive XLE RAV4 touts a tilt/slide power moonroof, dual zone automatic climate control, and Display Audio with Navigation and Entune. In addition to the previously mentioned LE and XLE features, the RAV4 Limited contains nifty extras like Premium SofTex seating, eight-way power driver’s seat with memory, heated front seats and optional Blind Spot Monitor with Rear Cross Traffic Alert. Introduced in 1996, the Toyota RAV4 was the very first compact crossover SUV. Designed for drivers craving the benefits of a SUV with increased fuel economy, the RAV4 paved the way for vehicles like the Honda CR-V, Subaru Forester and Ford Escape.